Perfect addition to your Pride outfit!Some Buyers Feedbacks:❤ This is so gorgeous! I love the how huge the flowers are, and the colors are vibrant. If I may say so myself, I think I looked gorgeous in it this past weekend at the 2017 Atlanta Pride Festival. This was perfect for the occasion, and it seems to be of great quality. Nothing is fallen off or become detached after several hours of use. It fits perfectly and is fairly comfortable. It's not too tight, and it's not too loose. At first, it was slightly uncomfortable, but my head quickly got used to it, so it ended up being very comfortable for the several hours I was wearing it. I will definitely keep wearing it to future Pride Festivals.❤ This headband was beautiful and high quality! It stayed in place all night and the flowers really stand out. I added a few butterflies from a craft store for added effect. Definitely recommend!❤ Very pretty and comfortable to wear for anyone. I like that the flowers are big as it gives a dramatic effect. 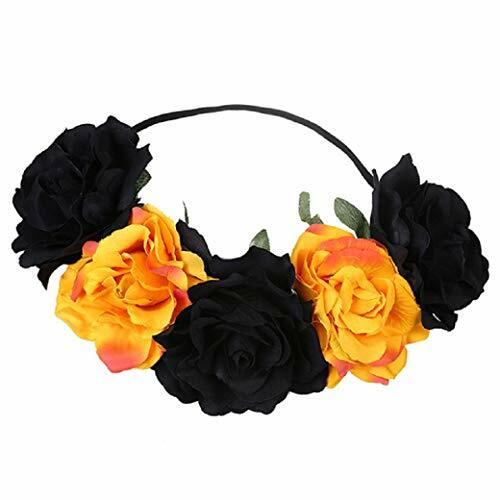 The headband is well constructed and it fit comfortably on my head.